On March 10, 1981 Edgar F. Kaiser Jr., the new owner of the Denver Broncos, announced that he had fired Head Coach Red Miller and GM Fred Gehrke. In a youth movement, he was replacing them with Dan Reeves, 37, and Grady Alderman, 42, stating that he preferred to communicate with people his own age (Kaiser was 38). While Red Miller had guided the Broncos to their first postseason and Super Bowl appearances in 1977, they hadn’t made it past the first round in 1978 and ’79 and the club slid further to 8-8 in ’80. A sound squad defensively, the team’s conservative offense was heavily criticized. 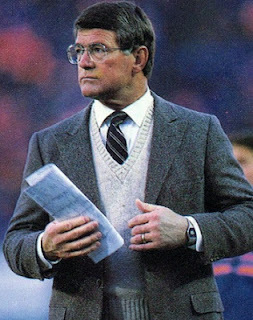 Dan Reeves had been an assistant coach in Dallas for ten years following his eight-year playing career and speculation had been that he was the heir apparent to Tom Landry as head coach. He showed frustration with waiting, however, and his name was prominently mentioned when coaching vacancies had come up in recent years. He turned down an offer from the Falcons four years previously, believing he wasn’t yet ready. Reeves, the ninth head coach in Broncos history, retained Joe Collier as defensive coordinator (as well as the rest of the defensive staff), admitting to not having knowledge regarding the “flex defense” that the Cowboys had employed. It seemed as though turning things around quickly on the offensive side of the ball would be difficult for the new coach. At quarterback, Reeves had former Dallas teammate Craig Morton, a capable veteran but 38 years old coming into his 17th pro season, plus undistinguished Matt Robinson, Jeff Knapple, and rookie Mark Herrmann available. The running backs were solid but unspectacular and the best of the receivers, TE Riley Odoms and WR Haven Moses, were showing signs of wear. On the upside, the line, anchored by C Bill Bryan, was solid. Despite the low expectations, the Broncos got off to a 5-1 start in ‘81, on their way to a 10-6 record that just fell short of the playoffs. Morton was reinvigorated and had one of his finest seasons, passing for 3195 yards and 21 touchdowns. Free agent WR Steve Watson came from nowhere to gain 1244 yards and scored 13 TDs on 60 catches, thus earning selection to the Pro Bowl. Rookie RB Rick Parros led the team with 749 rushing yards while Dave Preston rushed for 640 yards and caught 52 passes for 507 more. It was a fine beginning but it couldn’t be sustained. The Broncos fell to 2-7 during the strike-shortened 1982 season. Morton yielded the starting quarterback job to Steve DeBerg and retired. Watson was less spectacular and rookie running backs Sammy Winder and Gerald Willhite were works in progress. But for 1983, the Broncos swung a deal that would resonate for many years when they obtained the rights to QB John Elway, who had been drafted first overall out of Stanford by the Colts but was unable to come to terms. 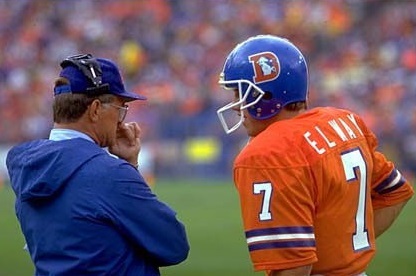 Elway went through first-year growing pains and split time with DeBerg (which split the locker room as well) during a season in which the Broncos went 9-7 and reached the postseason for the first time in four years. Reeves took a great deal of criticism for his handling of the rookie phenom and DeBerg was dealt to the Buccaneers afterward. It set the stage for a 13-3 record in ’84, the first of four straight seasons in which Denver won in double digits. The workmanlike Winder helped by rushing for 1153 yards and Watson led the receivers with 69 catches for 1170 yards. Collier’s defense did its part, allowing both the fewest points (241) and touchdowns (26) in the AFC despite not ranking high overall. The team advanced to win consecutive AFC titles in 1986 and ’87. Along the way, wide receivers Vance Johnson, Mark Jackson, and Ricky Nattiel and TE Clarence Kay had been added to the offense. Inside linebackers Karl Mecklenburg and Ricky Hunley plus DE Rulon Jones were the key components of a defense that had chronic problems at nose tackle and in the backfield. Ultimately, however, Denver was too dependent on its franchise quarterback and the club’s weaknesses were exploited in bad Super Bowl losses to the Giants and Redskins, respectively. Injuries, most notably to Elway and Mecklenburg, played a major role in the Broncos sagging to 8-8 in 1988, but they returned to the Super Bowl in ’89. Rookie RB Bobby Humphrey rushed for 1151 yards, which boosted the offense, and in a significant change Reeves replaced Collier with Wade Phillips as defensive coordinator in order to install a more aggressive defense. Free agent DE Alphonso Carreker and rookie FS Steve Atwater were talented additions to the unit. But once again the Broncos came up well short in the Super Bowl, receiving a 55-10 drubbing from San Francisco. Reeves had health issues coming into the 1990 season, having surgery for blocked arteries. The team had injury problems, especially on defense, and the result was the first losing record for the Broncos since 1982 as they went from 11-5 to 5-11. Elway, who had often been frustrated with the constraints placed upon him in the offense, had an erratic year and publicly chided Reeves for a lack of communication. The result in 1991 was that Raymond Berry, Hall of Fame receiver and more recently head coach of the Patriots, was brought in as quarterbacks coach. Underachieving RB Gaston Green was obtained from the Rams and ran for 1037 yards. The defense also picked up three impact rookies in linebackers Mike Croel and Keith Traylor as well as DE Kenny Walker and the unit rose to the top of the AFC. Helped further by a last-place schedule, the Broncos returned to winning ways with a 12-4 record and reached the AFC Championship game. When the team dropped back to 8-8 in 1992, however, it was the end of the Reeves era in Denver. Over the course of 12 seasons, the Broncos went 110-73-1 during the regular season, falling under .500 twice. They made the playoffs in seven of those years, putting together a postseason record of 7-6 that included three AFC titles – but three big losses in the Super Bowl as well. Reeves moved on to the New York Giants and Atlanta Falcons, making it to the Super Bowl – and losing once more, ironically enough to the Broncos and Elway – with the latter club in 1998. He never again won with the consistency that he did in Denver, but still made playoff appearances with every club that he coached as well as garnering Coach of the Year recognition (with the Broncos, those awards came from the Pro Football Writers in 1985 and UPI in 1989 and ’91). As for the Broncos, Wade Phillips was elevated to head coach in place of Reeves in 1993 and was in turn replaced by Mike Shanahan, a former offensive coordinator under Reeves, two years later. Elway had some of his finest seasons and, with the addition of star RB Terrell Davis, finally reached the pinnacle with Super Bowl victories in 1997 and ’98.